In 2011, my friend had taken a home loan for buying a home in Bangalore. The home loan amount was 15 Lakh tenure was 20 years and EMI was Rs.14976. He got transferred to Mumbai before two years. He could have sold the old house and purchased a new house at Mumbai. But, he decided to purchase another house instead of renting. He has taken a second home loan of Rs 15 lakh for 20 years, for which EMI is about Rs.16, 550. His total EMI outgo is 31526 Rs/-. Increasing floating interest rates are making his life difficult. He is unable to manage hefty EMI amount for both home loans. In addition to that, the earlier income tax interest exemption benefit under section 24 is now no more reality. The maximum interest amount is capped at Rs.2 Lakh. He has no option but to sell his first home. There are many people in India who builds a second home to earn extra income or for living purpose. Buying a second home with the second home loan can be an attractive investment. However, before you proceed, here are a few tax implications that you must consider. If an individual is holding more than one property in his/her name, only one property is considered as self-occupied. Its annual income will be considered as NIL. Another property is considered as ‘deemed rented out’ if it is not given on rent. This consideration is for income tax purpose. You can select any property as self-occupied. It is not compulsory that first property is only taken as self-occupied. If one house is rented out and second house is self-occupied, actual rental income of rented house is considered for calculation of income tax. If both houses are rented out respective rental income from both properties is taxable. In case of joint ownership of property and home loan is taken on joint names, rental income is computed corresponding to percentage share of each co-owner. You can hold multiple properties in your name. There is no restriction whatsoever. 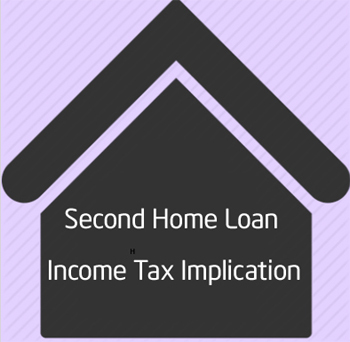 Home loan principal payment is exempted under section 80C. The maximum limit is 1.5 Lakh. This principal payment exemption rule is applicable only on the first house. (self-occupied property). For second home loan principal payment is not eligible for deduction under section 80 C.
You can also avail principal payment exemption benefit if you have let out or vacant property and you are staying in a different city for the work. Above rule of principal exemption is not applicable on under construction property. The tax exemption benefit on interest payment is allowed as per actual subject to a maximum of Rs. 2 lakhs (Rs. 3 lakhs for senior citizens). This condition is applicable for self-occupied for which construction is completed within 5 years from the end of the financial year in which loan is taken. For the second home or additional properties exemption on interest is capped at lower of either 2 lakhs or actual interest payment. If any additional interest payment is done it can be carried forward to set off against house property income of subsequent 8 years. If your property is rented or deemed let out, you need to use method given below to calculate Income or Loss from Property. If your property is rented annual rental income must be known to you. If it is deemed let out, you need to assume annual rental value based on market rates. You can deduct municipal tax paid on the house. In addition to that 30% standard deduction on rented income is allowed. Income or loss from property = Rs.90000 – Rs.2000 – Rs.27000 – Rs.120000 = -59000 Rs. The negative income indicates it is a loss from housing property and you need to reduce this amount from your taxable income. Should you buy Second Home for Rented Income or Tax Benefit? As per me, you should not buy a second home for rented income or tax benefit due to following reasons. Maximum interest deduction limit for a second house is 2 Lakh. This limit is applicable FY2017-18, AY 2018-19 onwards. This means you will not get that much tax benefit on a second home. A second house is considered as let out property (if not rented) and you need to consider equivalent rental income while calculating a tax. Considering present income tax rule and real estate market condition investing in second property is not recommended option. (1) If the loss from house property is adjusted against current income, then, there is no question of loss being carried forward. (2) Is it better to adjust the loss from house property against current income or it is better to carry forward the loss to be adjusted against future ‘income from house property’ only. If loss is more (above 2 Lakh) you can carry forward that to future. I think my question is not properly understood. 1. Loss from house property will arise only after adjusting ‘income’ from house property and after adjusting full Rs. 2.00 lakh allowable interest component against ‘income’ from house property. So there is no linkage between my ‘loss being carried forward’ and the Rs. 2.00 lakh limit for interest component. 2. My second question is whether I should carry forward the lone ‘loss’ from house property separately to be adjusted against future ‘income’ from house property; or, should I adjust the ‘loss’ from house property against my current year’s income including income from salary. 3. Now this gives me a third question : what happens when my ‘loss’ from house property is more than my ‘current year’s total income including from salary’ and that there is a net loss of income. Whether this ‘net loss’ of income is also allowed to be carried forward for adjustment against future years’ income. 1. Loss from house property will arise only after adjusting ‘income’ from house property and after adjusting full Rs. 2.00 lakh allowable interest component against ‘income’ from house property. So there is no linkage between my ‘loss being carried forward’ and the Rs. 2.00 lakh limit for interest component. – If you have taken home loan with higher amount Interest amount will be very high, hence loss from house property will be high which you need to carry forward. 2. My second question is whether I should carry forward the lone ‘loss’ from house property separately to be adjusted against future ‘income’ from house property; or, should I adjust the ‘loss’ from house property against my current year’s income including income from salary. – Adjust from current year income and if it is not reaching 2 Lakh limit you can use last year loss for adjustment. Thanks for reminding it was mistake which is corrected.